We have just returned from a 10 day holiday here. The staff are wonderful. The man on the reception helped us with our bags, took us to our apartment and showed us where the supermarket was as we arrived pretty late in the evening. The food in the Chicken Shack is excellent, 5 star. You can get a 3 course meal for 10 Euros, the staff are fantastic to. The apartments have a pool bar which is open all day and the ladies there are fantastic. It also does food which my son very much enjoyed. 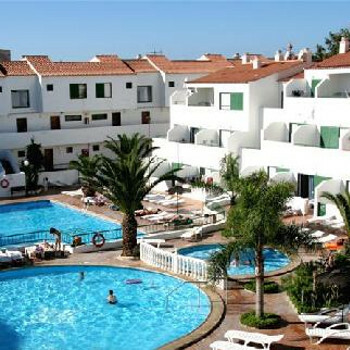 It has 3 great swimming pools, ideal for families, 1 baby pool,1 toddler pool and a big pool. Hotel tip: The food in the Chicken Shack is amazing. What can I say about this place. It was truely the worst hotel / Apartment i've ever been in. Check in was bad..I should have known from that moment it wouldn't be good. The "Owner" of the resort checked us in at noon..but informed us there were no available rooms. His attitute was terrible..how he spoke to myself "A paying customer" was totally uncalled for. The room, when we finally got in after 1500hrs was clean but very basic. Hardly any of the lights worked and the decor was very tired..Ants were running riot in the place. The pool area was noisy..apparently, about 65% of the apartments are private owned by Spanish holiday makers. They allow their kids to throw food into the pool, dive in on top of people, bomb beside were people are sunbathing and run around bathers sun loungers screaming at the top of their voices. There is a lifeguard..but he spends his time bathing under a parasol...I never saw him repremand anyone for their unruly behaviour in and around the pool. I was a fair bit away from the pool but my bag, book and i.pod were absolutely saturated with the local kids jumping in the pool and trying to splash the most. Night time is a joke..The "Locals" sit on their balconies, drinking until the wee small hours..They shout and bawl, play loud music and allow their kids to do likewise. Trying to reason with them is a joke. Eventually we went to reception to complain. Reports were written, the guard visited them on numerous occasions but nothing happened. They continues to shout and play loud music until 5am! There was NO entertainment..nothing. There is a steakhouse on site and the English couple who own it are very nice. The food was great and reasonably priced. There is a shop on site too and the owner is also very nice. There is a washing machine and dryer in the shop but it's pricy at 4E for one wash.
We had towels stolen from the balcony. Half of them have no gate and people can walk right in and help themselves to anything you leave on your balcony. Other's complained to the reception about kids toys been taken...They didn't care one iota. The pool bar is very expensive..about twice the price of anywhere else....which to be honest..there isn't much. We went because it was suppose to be a quiet, relaxing holiday. It wasn't. It was a joke. Although the cleaners did a so-so job of the inside of the apartments, the outside areas were disgusting. We had an uncovered drain under our window, which stunk to the high Heavens. We couldn't even open our window. All in all..As I said before, A horrible complex with unhelpful staff who don't give a monkey's if your not having a good time. It's dirty and stinks. Don't go...unless you want to slum it for the duration of your holiday. We do not accept posts from the country reviews. Please post on your return. Contact admin who will have a copy if required. We booked allocation on arrival, were very pleased with our welcome, and our room which was huge and very clean, and had nice view of the pool area from our balcony. The Hotel maids only visited once throughout our week,which was disappointing, but other than that we couldnt fault the Hotel, it was very nice. The Area in which the hotel is situated in Costa del Silencio was pleasing, many British bars within 100 yards of our hotel, but im guessing due to the time of year was fairly quiet. Had nice meal in the restaurant, very cheap too! The staff were very nice both in the pool bar and restaurant. Entertainment was rubbish, hate to say it but only consisted of a guy playing his electronic keyboard..EVERYNIGHT!!! Reception staff were very helpful and approachable, except for a spanish woman who always had a face like a slapped bum, and the stinking attitude to join it. The hotel was very basic but that didn't bother us as we had not planned to spend a lot of time there. the pool area was superb with 3 different size pools, the kids loved it! The restaurant on the premises was excellent for families. The food was very good and at good prices and the staff made us feel very welcome and relaxed. There was entertainment every night for all ages, singers, clowns, karoke. We stayed self catering so used the complex restaurant every night. The food was excellent, the entertainment was brilliant, something different every night, all top acts!! The owners of the pool bar and restaurant on the complex was a lovely Welsh couple and the rest of the staff there were superb too! Honestly, one of the best holidays I have been on! Value for money and recommended! When we first arrived the hotel was busy and we waited in the lobby for ages waiting to be checked in. We had just had a long overnight flight and had to wait even longer to be given our rooms as one of our rooms wasnt ready. When we got into our room it was clean and I found the cleaning ladies very helpful and friendly. The hotel food was lovely on the one occassion that we ate the it. The service was something to be desired, it took the waiter half an hour to come to our table for our drinks order and then we waited another hour for food to be served. The hotel itself was situated right on the main road, there were some shops around but not many. There wasnt much to do, i would recommend las almerica's although the weather is hotter so may not suit younger children. I found the hotel staff very insulting apart from the clown who became the best of friends with us. The security guard was friendly, he even translated a bit for my daughters, very helpful. The night receptionist was extremely ignorant to my daughters. The entertainment was reasonable for a quiet resort. We got most entertainment from our neighbours who were extremely rowdy at night, one even threatened to hit my daughter, accused her of ringing bells at four in the morning when I knew she was in bed sleeping. I wouldn't go back to this is you paid me. Its more of a community than a holiday resort, most were residents!!!!!!!!! When we first arrived at our apartment we were impressed with the cleanliness and layout of the apartment. It was fantastic value for money! Costa Del silencio was a lovely place to stay and the locals were friendly and inviting. It was cheap to eat out and drink which was useful for as we wanted a cheap holiday. It was a good distance from the bars as it was walking distance for us and our children, who had fun on the karaoke! When we arrived late Friday night, we were pleasantly surprised by the size of our apartment - we even had an upstairs! After throwing our cases in the room, we nipped next door to the Rocket bar for a quick drink, and were advised by the locals that we should be very careful as there had been loads of muggings & pick-pocketing going on. This scared us a bit. In the daylight our apartment was filthy. The bathroom had a lovely brown suite! Beware of all the men from Senegal living in the residential blocks of the apartments. We were sitting by the pool one afternoon to be greeted with "Hello baby, will you come take a bath with me!" Needless to say we got our towels and did one! The Welsh lady running the restaurant is rude to say the least! The breakfasts were awful. The Scottish entertainer in the evening was rubbish -nobody was clapping! We ate out every night in Los Christianos - wouldn't even try the evening meals in this restaurant. Hi we have just returned and yes it a little out of the way, from the noise and touts. You can get a bus to Americas which takes 25mins. They run every 20mins and are Cheap 6 euro's for the 4 of us. The hotel restautant has recently been taken over by Simon and his wife. They ran the pool bar before. They have done a great job and the food is great. They are doing there best to repair the damage the previous owners did. The Chinese restautant down the road, 10mis walk is the best and so cheap.